As I tried to recreate the visual effect of a bright pink and orange sunset setting into the ocean, I also tried to be intentional about the gemstones and beads that I used and looked for ones whose meaning would match my intentions. For me, watching the sun set into the ocean each night fills me with peace, reminds me that impermanence can be beautiful, makes me reflect on the day and feel gratitude for its contents, good or bad. 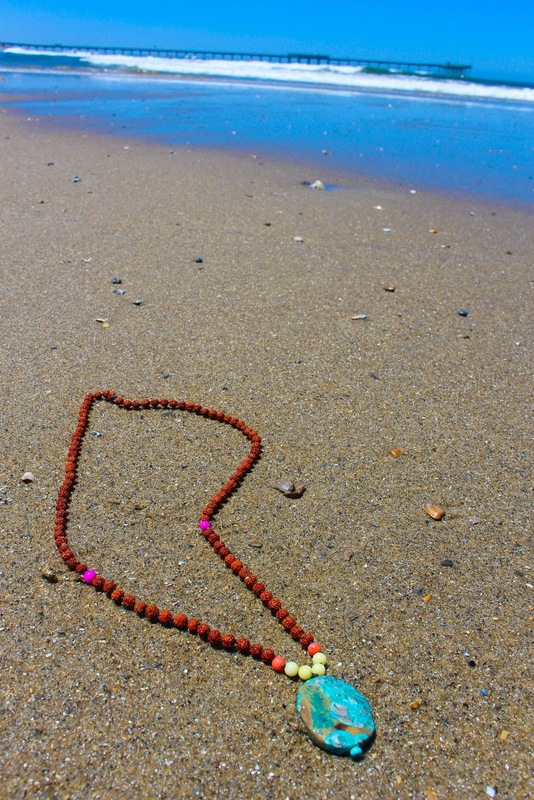 The Ocean Sunset Mala is meant to capture those sentiments of love and light, peace and gratitude, acceptance and transitions. I am surrounded by warm, golden light. I can find stillness beneath the surface. I can fight the waves or ride them. I am grateful for endings. Peace lies beneath the surface. I reflect golden light like the ocean reflects the sunset. I am open to the possibilities of tomorrow. My light spreads as wide as the ocean. I manifest my inner peace. Endings create space for beginnings. My love is as bright as the sun and as deep as the ocean. I surround myself with an ocean of shimmering light. Love and light flow easily to me. Select an intention to guide your mala making. You'll keep your intention in mind as you tie each knot. Starting with your tiny turquoise stopper bead, take your nylon cord, fold your length of cord in half, pass the fold through the hole in the stopper bead, then pass the ends of the cord through the loop (Lark's head knot) and pull taut. Pinch both ends of the cord together and pull through the center hole of the guru bead, sliding it all the way down so that it sits flat against the turquoise stopper bead. If you'd like, put a dot of jewelry glue on top of the stopper bead to keep it flat against the Sea Sediment Jasper. Taking the righthand side cord, make an overhand knot tight against the Jasper, then add one of the Lemon Yellow Mountain Jade beads. Tie another overhand knot as tightly as possible against the top of the bead. Repeat once more so that there are two Lemon Yellow Mountain Jade beads on the righthand side, with overhand knots on either side of them. Add one Orange Coral bead, securing in place with a tight overhand knot. Continue to add 15 Rudraksha Seed beads, tying an overhand knot tight against each one as you say or think of your intention. Note: You may need to use the bead reamer to widen holes in some beads to get them onto the cord. Once you have reached 18 beads on the righthand side, add your Dyed Pink Agate counter bead. Knot 35 more Rudraksha Seeds onto the righthand side, for a total of 54 beads. Knot the last bead tightly and leave the remaining cord. Repeat steps 4-8 on the lefthand side, occasionally cutting the very tip of the cord as needed to keep the ends clean and not frayed. Frayed ends will be harder to get through the beads. Once both sides are complete, tightly tie the ends of the cords together and double knot. Coat with a drop of jewelry glue or clear nail polish and cut the excess cord once dry. Remember to cut closely to the knot so as not to leave any excess cord sticking out. If you'd like to clear or charge your mala, leave it out under the full moon or burn sage as a finishing touch. I'd love to see your malas! 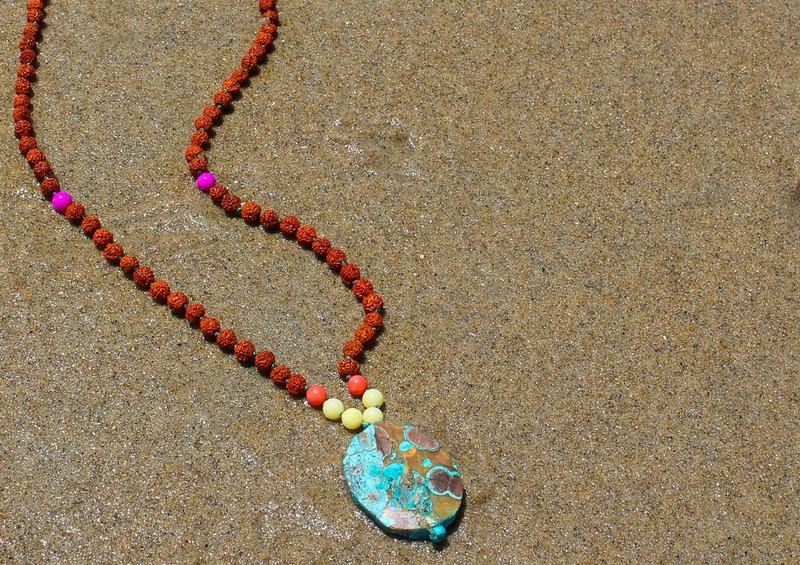 If you follow this design, be sure to tag me on Instagram (@sanbriego) and use the hashtag #oceansunsetmala! and I'll send you everything you need to make this design!